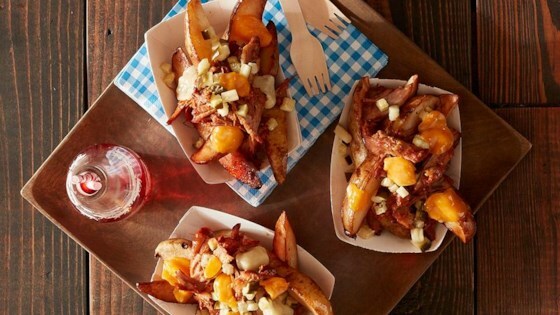 "Make this all-star Pulled BBQ Pork Poutine recipe that is topped off with delicious cheese curds and bread and butter pickles for the ultimate taste!" Season the pork on all sides with salt and pepper. Heat 1 tablespoon of olive oil in a large frying pan and cook the pork shoulder on all sides, about 4 minutes per side until browned. Place the pork into a slow cooker lined with a Reynolds(R) Slow Cooker Liner and pour in water and BBQ sauce and cook on high heat for 4 hours or low heat for 6 hours. Pull the pork apart using two forks until it is shredded and keep warm. Place a 1 1/2- to 2-feet-long sheet of Reynolds Wrap(R) Aluminum Foil on a table and place the potato wedges in the center of the foil. Drizzle on the remaining 6 tablespoons of olive oil, season with salt and pepper, and then fold up the outside of the foil to create a foil packet. Place packet directly on a medium-hot grill and cook for 25 to 30 minutes or until the potatoes are browned and cooked through. Serve the pulled pork over top of the potato wedges, cheese curds and diced pickles. Make a Reynolds Wrap® Aluminum Foil packet for delicious-tasting food and easy cleanup. Line a slow cooker with a Reynolds® Slow Cooker Liner for easy cleanup.